The Silver Pagoda Phnom Penh sits next to the Royal Palace, separated by a walled walkway, but within the same larger walled compound. 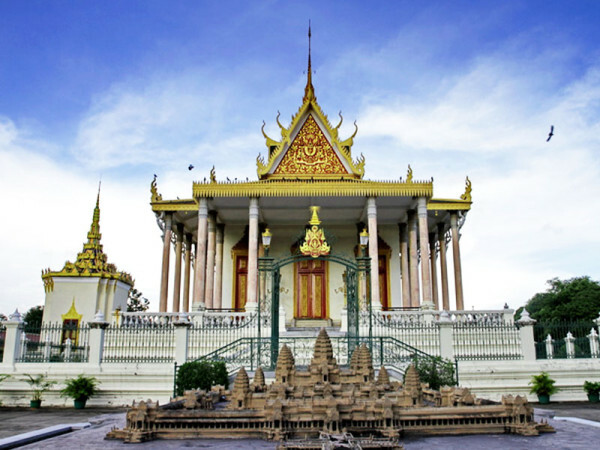 The Silver Pagoda’s proper name is Wat Preah Keo Morokat, which means ‘The Temple of the Emerald Buddha,’ but has received the common moniker ‘Silver Pagoda’ after the solid silver floor tiles that adorn the temple building. 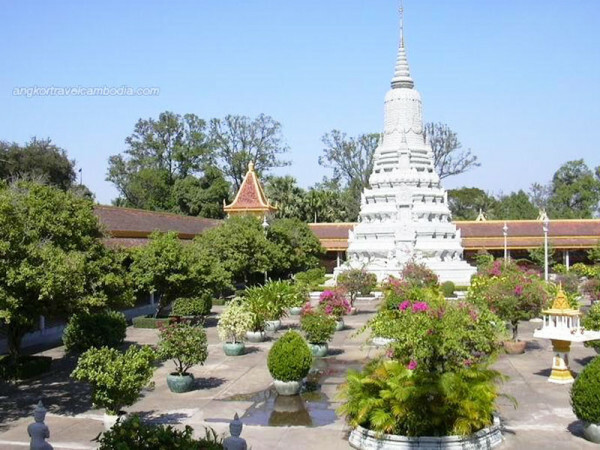 The pagoda compound as a whole contains several structures and gardens, the primary building being the temple Wat Preah Keo Morokat and other structures including a library, various stupas, shrines, monuments, minor buildings and the galleries of the Reamker. Wat Preah Keo Morokat is unique in several ways. 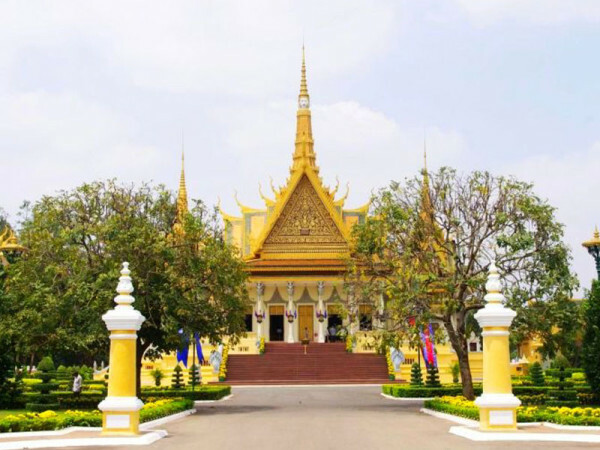 It is the pagoda where the King meets with monks to listen to their sermons and where some Royal ceremonies are performed. 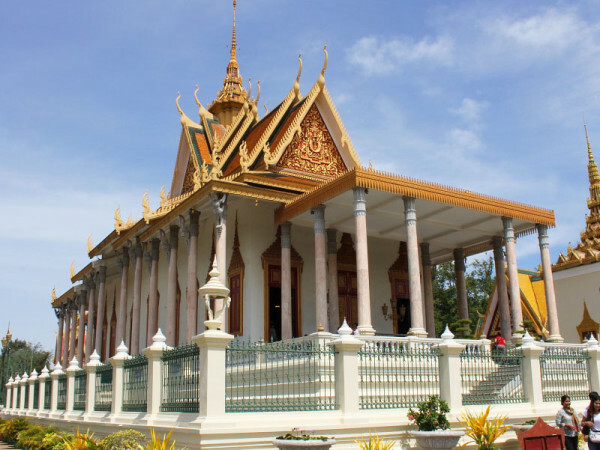 It houses a collection of priceless Buddhist and historical objects including the ‘Emerald Buddha.’ And, unlike most pagodas, no monks live at the pagoda. 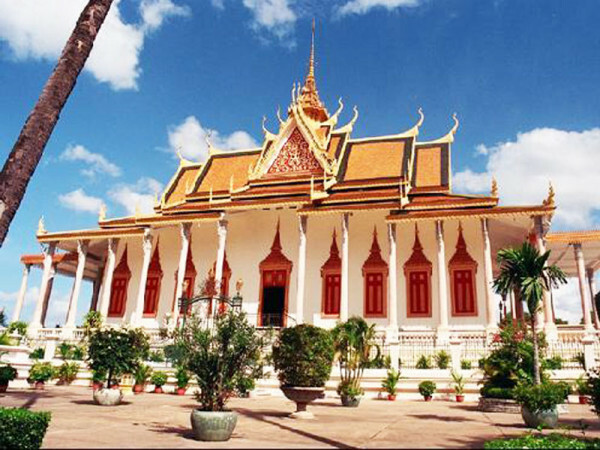 The temple building, library and Reamker galleries were first constructed between 1892 and 1902 under King Norodom. The equestrian statue of King Norodom was set in place in 1892. Other structures such as the stupas of King Ang Doung Stupa King Norodom (1908), the Kantha Bopha memorial sanctuary (1960) and others were added later. The temple received major reconstruction in 1962 and further renovations 1985-1987, particularly to the Reamker fresco murals. Many of the temple treasures were looted during by the Khmer Rouge 1975-1979, but fortunately the Khmer Rouge chose to keep much of the collection intact for propaganda purposes. 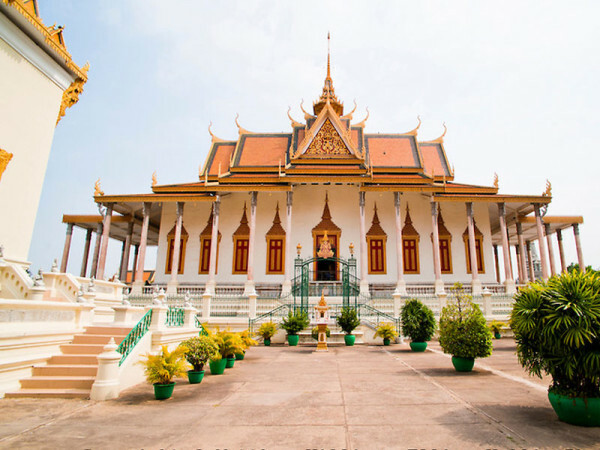 Within the Royal Palace compound is the extravagant Silver Pagoda Phnom Penh, the floor of which is covered with five tons of gleaming silver. You can sneak a peek at some of the 5000 tiles near the entrance – most are covered to protect them. Rivalling the floor, an extraordinary Baccarat-crystal Buddha sits atop an impressive gilded pedestal. Adding to the lavish mix is a life-sized solid-gold Buddha, which weighs 90kg and is adorned with 2086 diamonds, the largest weighing in at 25 carats.